Possibilities for the fate of oceanic plateaus at subduction zones range from complete subduction of the plateau beneath the arc to complete plateau–arc accretion and resulting collisional orogenesis. 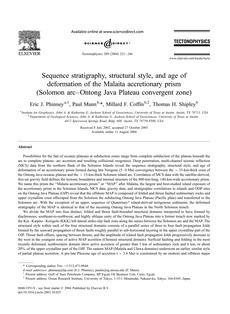 Deep penetration, multi-channel seismic reflection (MCS) data from the northern flank of the Solomon Islands reveal the sequence stratigraphy, structural style, and age of deformation of an accretionary prism formed during late Neogene (5–0 Ma) convergence between the ∼33-km-thick crust of the Ontong Java oceanic plateau and the ∼15-km-thick Solomon island arc. Correlation of MCS data with the satellite-derived, free-air gravity field defines the tectonic boundaries and internal structure of the 800-km-long, 140-km-wide accretionary prism. We name this prism the "Malaita accretionary prism" or "MAP" after Malaita, the largest and best-studied island exposure of the accretionary prism in the Solomon Islands. MCS data, gravity data, and stratigraphic correlations to islands and ODP sites on the Ontong Java Plateau (OJP) reveal that the offshore MAP is composed of folded and thrust faulted sedimentary rocks and upper crystalline crust offscraped from the Solomon the subducting Ontong Java Plateau (Pacific plate) and transferred to the Solomon arc. With the exception of an upper, sequence of Quaternary? island-derived terrigenous sediments, the deformed stratigraphy of the MAP is identical to that of the incoming Ontong Java Plateau in the North Solomon trench. We divide the MAP into four distinct, folded and thrust fault-bounded structural domains interpreted to have formed by diachronous, southeast-to-northwest, and highly oblique entry of the Ontong Java Plateau into a former trench now marked by the Kia–Kaipito–Korigole (KKK) left-lateral strike-slip fault zone along the suture between the Solomon arc and the MAP. The structural style within each of the four structural domains consists of a parallel series of three to four fault propagation folds formed by the seaward propagation of thrust faults roughly parallel to sub-horizontal layering in the upper crystalline part of the OJP. Thrust fault offsets, spacing between thrusts, and the amplitude of related fault propagation folds progressively decrease to the west in the youngest zone of active MAP accretion (Choiseul structural domain). Surficial faulting and folding in the most recently deformed, northwestern domain show active accretion of greater than 1 km of sedimentary rock and 6 km, or about 20%, of the upper crystalline part of the OJP. The eastern MAP (Malaita and Ulawa domains) underwent an earlier, similar style of partial plateau accretion. A pre-late Pliocene age of accretion (∼3.4 Ma) is constrained by an onshore and offshore major angular unconformity separating Pliocene reefal limestone and conglomerate from folded and faulted pelagic limestone of Cretaceous to Miocene age. The lower 80% of the Ontong Java Plateau crust beneath the MAP thrust decollement appears unfaulted and unfolded and is continuous with a southwestward-dipping subducted slab of presumably denser plateau material beneath most of the MAP, and is traceable to depths >200 km in the mantle beneath the Solomon Islands.